In 2015, F. A. and Gertrude Seiberling's country estate, Stan Hywet, will be one hundred years old. Unlike many mansions that were destroyed by the wrecking ball, the edifice in Akron, Ohio, still stands and visitors walk through its halls and gardens regularly. The "stone quarry" is the centerpiece for many events and ceremonies, as it was from the beginning when the Seiberlings opened its doors to employees, world-famous musicians, and corporate moguls. The six-five-room Tudor Revival mansion exudes a sense of history. The house is noted for its intricate paneling, made from American oak, rosewood, and chestnut. Innovations in the home include a built-in vacuum system and a thirty-seven-station telephone/intercom system. The extensive gardens at Stan Hywet once encompassed over a thousand acres and were designed by renowned American landscape architect, Warren Manning. Today, seventy acres accompany the estate, including a formal English garden redesigned by Ellen Biddle Shipman in 1929 and restored in the 1990s; a Birch Tree Allée; the Dell, a wild, naturalistic woodland garden; and a Japanese Garden. 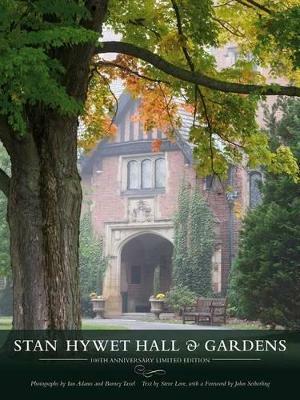 Revised and updated for the anniversary with many new images, photographers Ian Adams and Barney Taxel portray the splendor of all four seasons at Stan Hywet. These vivid images depict the restored mansion in its magnificent setting, capturing the springtime charm of mayapples and periwinkle in the Dell, the classic elegance of Gertrude Seiberling's Music Room, and the stark grandeur of snow-covered oaks mirrored in a reflection pool. From spring mornings to Christmas celebrations, Steve Love narrates as the reader strolls through the rooms and halls of the mansion and rambles down the lanes through its magnificent gardens and into the lives of the Seiberlings. With a foreword by F. A. 's grandson, former congressman John F. Seiberling, Stan Hywet Hall & Gardens captures the Seiberling family motto, Non Nobis Solum, or, "Not for Us Alone"--a motto which remains engraved, to this day, above the entrance to the Manor House. Ian Adams is an environmental photographer based in Cuyahoga Falls, Ohio, specializing in natural, rural, historical, and garden photography. Ian has carried out garden photography assignments for landscape designers and for Country Gardens, Fine Gardening, Family Circle, Horticulture, Midwest Living, and Organic Gardening magazines. He has published several books including A Photographer's Guide to Ohio, The Art and Craft of Garden Photography, and Our First Family's Home: The Ohio Governor's Residence & Heritage Garden.